Tethered between the front of our catamaran’s 44-foot-long hulls, the trampoline is bouncy against my back, and the fabric is leaving small square imprints on my lazy body. Puffy clouds, as white as whipped cream, drift by on the warm breeze and the gentle sway of the ocean is trying to coax me into snooze-land. But sleep isn’t an option. The setting surrounding me is triggering sensory saturation I have been picked up and dropped into one of those quintessential postcard scenes. Crystal-clear turquoise waters envelop the islands we pass, each heavily weighed down with bright green, giant-leafed foliage straight out of the film Jurassic Park. 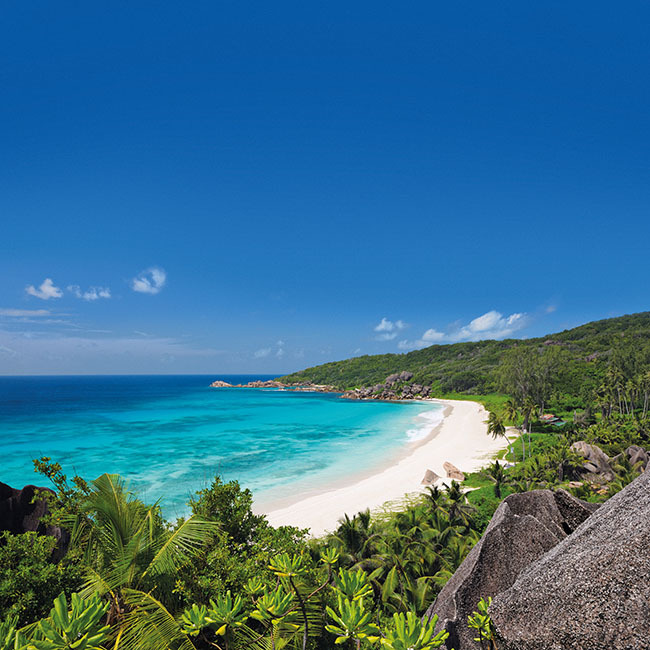 Seychelles comprises 115 islands, of which 43 – 41 granitic and two coraline make up the ‘inner islands’. Lying just four degrees south of the equator, the weather here is sunny and warm most of the year, and there’s no debating that hopping between the islands with a yacht charter company such as Sunsail, paired with an experienced sailor, is the best way to enjoy this chunk of Seychelles. Turns out we’ve been blessed with both – a catamaran named Delphine, with four air-conditioned en-suite cabins and ample shared living space, and Jeremy, our easy-going 25-year-old skipper, who has the skill and confidence of a man twice his age. We quickly discover that Jeremy knows all the best coves, snorkelling spots and beaches to visit. The puzzled look on his face at my poor attempt at chopping chillies on our first night is also a clear giveaway that he’s a whizz in the galley – a hunch later confirmed by his delicious baked fish dishes. From Eden Island marina on the main island of Mahé, we navigate around the northern fringe, dropping anchor for the night at Port Launay, a quiet bay on the north-west corner. Mahé is the largest and most densely populated island, its tall granite mountains reaching some 900m into the sky covered with a lush green blanket of plants and trees. 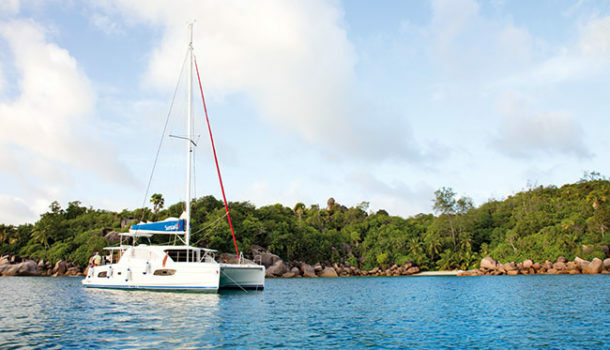 The next morning is a 50 km crossing – our longest sailing leg to La Digue, Seychelles’ third-largest island. Measuring only 10 km², it’s no bigger than a few Joburg city blocks, although somewhat more idyllic. And, unlike in Jozi, the best way to go exploring here is to rent a bike. Only 150 Seychellois rupees per person secures us each a two-wheeler for the day … and a slightly tender bum by the end of it, but it’s totally worth it. 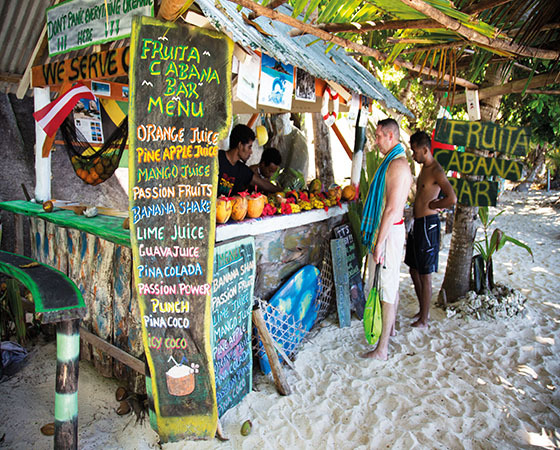 Day and night, La Digue buzzes to the sound of both locals and tourists scurrying around the mostly flat island on bicycles. It’s a spot you could easily spend a few extra nights in it’s about as ‘tropical holiday’ as you can imagine: white sand beaches, palm-frond-covered stalls selling fresh fruity cocktails and, as a backdrop, calm reef-sheltered lagoon waters for swimming. But it’s the head-high body-surfable waves and the balmy water at the more exposed Grand Anse beach that keep me occupied for hours, perfectly topped off with post-workout refreshments at Loutier Coco, right on the sand. There may not be dinosaurs traipsing through the Seychelles’ Jurassic flora, but having sailed from La Digue, we’re soon standing among 200-year-old giant tortoises on Curieuse Island, a protected conservation area for these ancient reptiles. Situated approximately two kilometres north-east of Seychelles’ second-largest island, Praslin, Curieuse was a designated leper colony right up until 1965. At Anse St Joseph, on the south-west corner, a doctor committed his time to treating the sick, and today his residence stands as a museum and education centre. It’s also the starting point of a sweat-soaked hike through a dense forest canopy and then along a mangrove-fringed boardwalk to the tortoise nursery. Making friends with these behemoths is easy when you offer them some of the juicy leaves just out of reach of their wrinkly, outstretched necks. A day later or perhaps two, as I’ve lost all track of time I’m completely surrounded by schools of quizzical fish, staring at me staring at them, and I can’t help wondering who is more entertaining in this scenario. With my board shorts, flippers, snorkel, mask and mesmerised expression, I’m pretty certain it’s me who looks out of place. Jeremy’s anchored us near one of his favourite coral reefs, more colourful than a Van Gogh masterpiece and strikingly delicate. Long fish, stubby fish, spiky and flat fish all drift by, casting sketchy glances at me over their pectorals. This is an otherworldly wonderland into which none of life’s stresses intrude, and it’s only when my wrinkled bathwater fingers become a bit too unwieldy that I eventually climb back on to our boat. Before plotting a course back to Mahé on our last day, Jeremy rewards us with a few more idyllic coves that appear to be completely untouched by human hands. For our last stop, he anchors Delphine just offshore of Anse Lazio on Praslin’s northern edge, close enough for us all to plop off the side and swim to the beach. Here, set back among the palm trees and almost out of sight, is an unmanned bar operating on an honesty system, which epitomises the Seychelles’ tropical holiday vibe. Dropping our rupees in the jar, it’s not long before we’re relaxing with our ice-cold drinks, savouring the unforgettable view in front of us. Victoria, on the main island of Mahé, is the capital city. 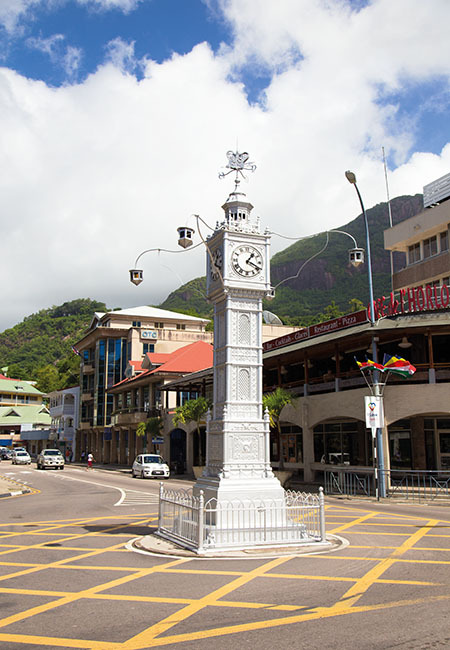 A small clock tower, erected in 1903 in the middle of town as a memorial to Queen Victoria, is a replica of the 1897 golden jubilee clock found in central London. The Seychelles international airport is located a short distance from Victoria. 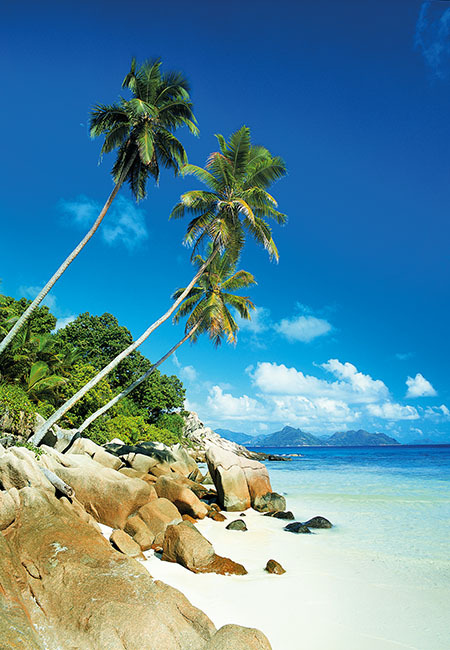 The Seychelles archipelago is made up of Earth’s oldest oceanic islands. First sighted by Portuguese explorers in 1502, it took until 1609 for the initial landing on the uninhabited territory to be recorded by sailors of the English East India Company. The French made expeditions there in 1742 and 1744, and a possession stone was laid in 1756 before settlers arrived in 1770. In 1814, under the Treaty of Paris Seychelles became a British colony. An influx of liberated African settlers arrived at the turn of the 20th century. Seychelles was administered from Mauritius until 1903, when it became a Crown Colony. In 1976, it was finally declared an independent republic. 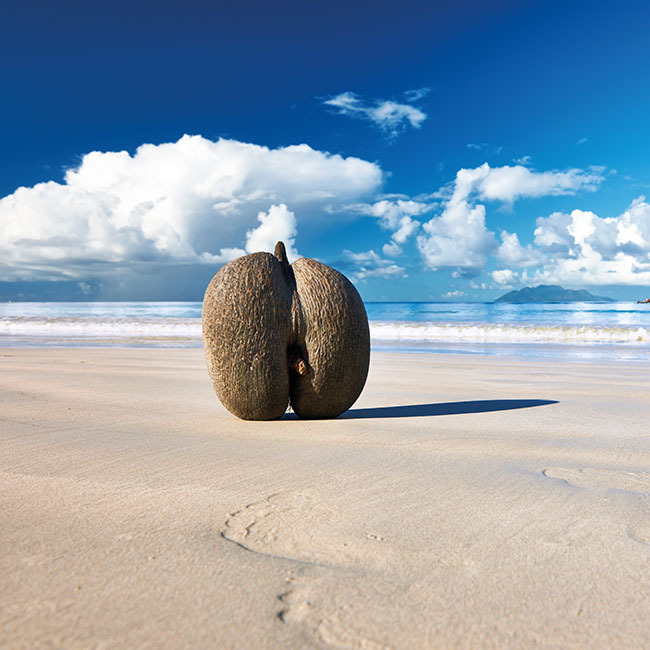 Endemic to the Seychelles, this uniquely shaped ‘double coconut’ comes from a large rare palm that is now only found on the islands of Praslin and Curieuse. The mature coco de mer fruit weighs 15 to 30 kg and contains the largest seed in the world. Air Seychelles flies direct from Mahé to Joburg and back on Wednesdays, Fridays and Sundays. On-board, you can expect top-class service from the friendly crew, comfy seats and delicious food. Taxis can be expensive, but local buses in the main centres – although cramped and a bit hot inside – will get you where you need to be at little cost. Rent bicycles near the little harbour on La Digue for around R150 to go exploring. Sunsail is a global name in yacht charter holidays. Sailing between Seychelles’ inner islands is one of the best ways to experience this paradise, as experienced skippers know the best places to visit and drop anchor. Everything you need is on-board, including air-conditioned cabins, flush toilets, showers, and fully equipped kitchens in which to cook your meals on a self-catering basis – not to mention snorkelling gear. You needn’t have any sailing experience to enjoy a holiday with Sunsail. A four-cabin catamaran, sleeping eight people, starts at $680/day. It’s advised that you book a seven-day charter to explore all the inner islands. Featuring 74 deluxe rooms, 12 luxury suites and a presidential suite, Eden Bleu Hotel is the perfect place to stay before and after your Sunsail yachting adventure, which sets sail from Eden Island Marina adjacent to the hotel. The hotel is only 10 minutes’ drive from the international airport, and a short drive to Victoria’s city centre. Eden Bleu’s in-house app means everything you might need is right at your fingertips, on your cellphone or tablet. Cool off in the infinity pool overlooking the marina, dine at one of the restaurants, or make use of the world-class conference facilities if you’re travelling on business. 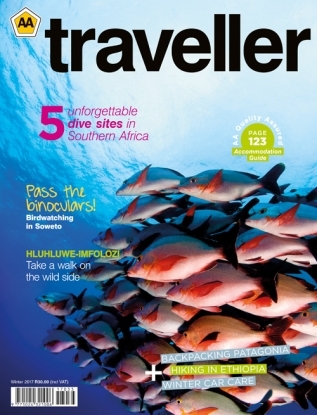 For a wealth of information about Seychelles, get in touch with the Seychelles Tourism Board (STB), which recently received the Indian Ocean’s Leading Tourist Board award at the World Travel Awards.